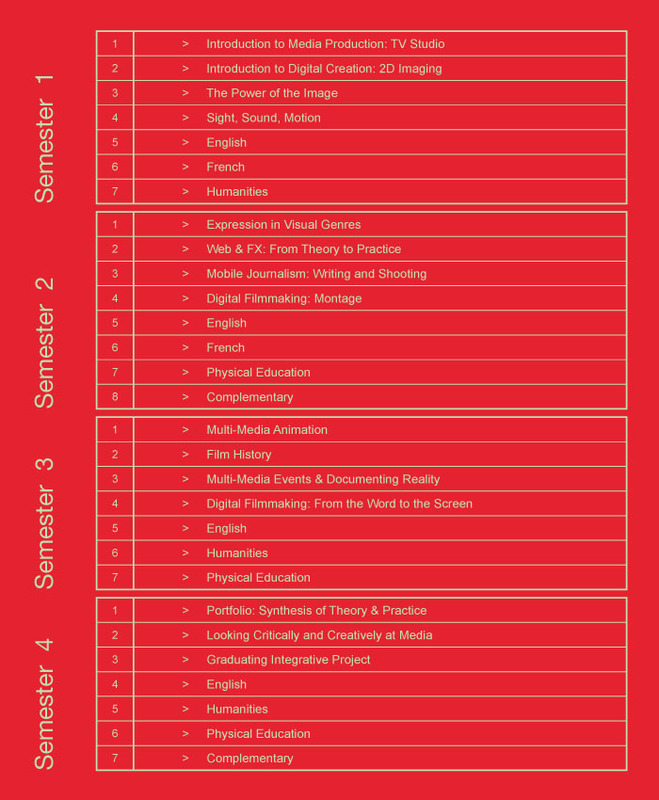 Film and New Media is one of two interconnecting Media profiles in the Arts, Literature and Communication program. This pre-university program is an exciting mix of theory and practice that gives you a chance to experiment and create using a variety of media. In the Film and New Media profile, you will progressively master the fundamentals of writing, shooting, recording sound, and editing, whether in fiction film, television, animation, radio or any number of multi-media platforms. Through written and visual communication, you will sharpen your creative abilities, critical thinking, and academic skills. The courses take place in our exciting television studio, workshop spaces and digital lab. In the journalism and documentary courses you will apply your creative and technical skills to the telling of real-life stories that are important to you. In the filmmaking classes, you will invent your own stories and learn how to bring these ideas to screen. You will also have the chance to experiment in special effects and animation as well as develop your sense of critical thinking through subjects that vary from film history to the analysis of contemporary visual culture. In our media saturated world, visual literacy is more important than ever. Our graduates are able to transfer their learning into almost any field requiring an understanding of the creative process, selfmotivation, and project management abilities. Our graduates have found careers in advertising, marketing, journalism, film production, television, radio, animation, app design, computer gaming, special effects design, education, music production, photography, acting, public relations and many other fields. Join us and prepare to engage in exciting studies that will open doors to a world of possibilities.